This Friday I was at the University of Hong Kong, giving a guest lecture in its Environmental Journalism class (graduate-level). I talked about how social media can help environmental journalists and this field of journalism, from finding story ideas to marketing your story. Below is a summary of what I covered in that one hour, combined with the comments from the audience. Some clarifications first. One on environmental journalism. It goes into mainly two streams: scientific or political. Water pollutions, new energy, waste recycling, etc. goes into the first category. Scientific environmental journalism requires the journalist to understand the issue well, and explain it well. Political environmental journalism has much to do with the government policy and non-governmental organizations, and the very typical example is climate change. For this, journalists need to be careful of staying objective. Another clarification goes to social media. It is not only about Facebook. It is all about interaction and community. So how do you, as a journalist, find out what is happening? Following NGOs on Facebook to see what causes they are initiating and following environmentalists on Twitter to see what activities they are involved in is of course what you can do, or should have done. But there are also sites where you can find it out more easily. Check this site out: Change.org. 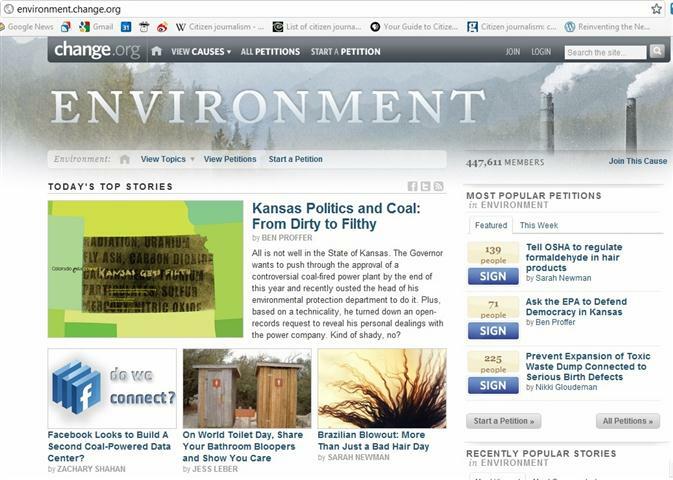 It is a community site full of causes and petitions. It is where people gather together, raise the problems they find, and vote for those they consider as serious. It is straightforward – what is the problem, what is people’s reaction, what does people care about the most. So find your inspiration, and dig into the problem, get your story. It is especially good for countries like the U.S. or China, where a single issues (such as air pollution) can affect lots of people in different areas. With out this kind of online community, it is hard to collect people’s opinions so easily. As a journalist, you need to be on the site. To leverage the power of social media, you need to be equipped with good technology – iPhone or whatever smart phones. And you do live reporting. This is exactly what the journalist from the Southern Metropolitan Daily did when Guangzhou citizens were protesting against the proposal of incinerator construction. You may find the English translation here on EastSouthWestNorth. Its original Chinese version disappeared, and the news itself was not allowed to report in China. So here comes citizen journalism. Click here for a set of photos that LEMONed, a web developer and blogger in Guangzhou, took on the scene. Chinese tweeples spreaded the photos, and the issue got more attention online, and more people joined the demonstration. The end of the story is that the government was forced to initiate environmental assessment for this project. 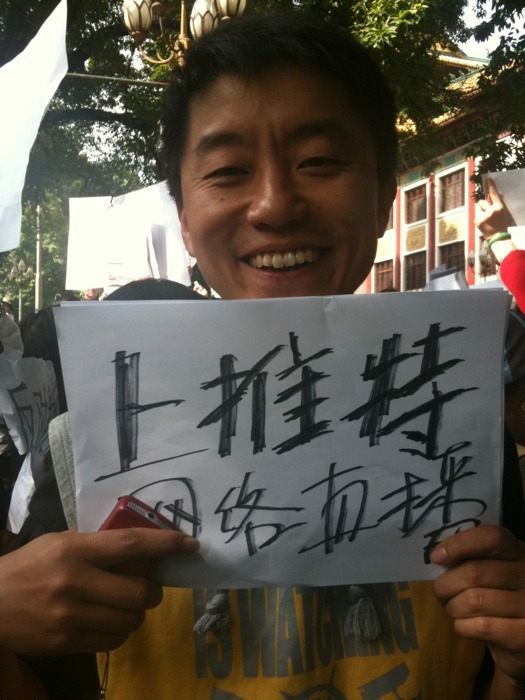 Below is a photo by LEMONed, of a normal citizen holding a white board, saying: Get on Twitter, Broadcast live online. I love text. But I am also a strong supporter of getting stories beyond text – if you have a good video, get it on Youtube and share to others. If you can use graphics to illustrate or explain the complicated background of the story, do it, and there are plenty of brilliant environmental inforgraphics out that that you can take reference of. In the talk I particularly talked about mapping, and used the Gulf Oil Spill as a case. 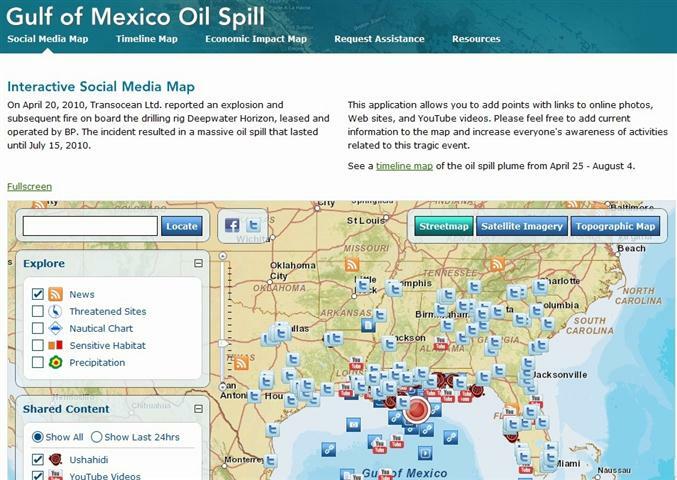 I showed two maps, one from Mapthespill, and another from ESRI – below is a screenshot. The latter one integrates news from major news organizations such as the New York Times and the Washington Post (the RSS logo), and also Tweets, Youtube videos, Ushahidi reports, Flickr photos, etc. This is a good example on how social media can help present the story – you see real-time what people are talking about, and what newspapers are reporting. However, while this particular map is issue-oriented, and as the audience pointed out, some of the news/tweets are no longer relevant. But I recall four months ago, when I was relying on the map for updates of the story, it was pretty accurate and helpful. Freelancing is more and more popular. So if you are a freelancer, or determined to be one, and you are to do a serious environmental story, which would always require trips and investigations that end up with huge cost – what do you do? Spot.us provides an answer – at least to some extent, and in some countries. The site adopts a microfinance model – you raise a story idea, states clearly how much money you need to do it, and people donate five bucks or twenty bucks – while you get enough supporters and enough money, you go ahead to do the story, and offer back the story to your supporters. One from my audience raised his concern on whether this kind of model would work in Hong Kong – he said that this kind of micropayment would require a strong sense of community, so that people see the value of the story and they are willing to fund. That is a good point. We haven’t seen much good microfinance cases in this city, but we do see some in China – where so much happening but not so many good stories are allowed to produce. A good chance there. This is the easiest part. After you’re done with a great story, just get it on all the social media, as many platforms as you can. One lady from the audience is an experienced environmental journalist who used to work for New York Times’ Green blog, and some other major news organizations. She emphasized the importance of building personal reputation online – as a journalist, you can no longer be satisfied by your byline only. Learn to present your story to your readers in a more live way, and learn to communicate with them directly. Delay no more. At the end I talked about the product that I managed in the South China Morning Post – CitizenMap, which is a good example to illustrate how it can help journalists in the five steps mentioned above. But I’ll save it to another post. I am not an environmental journalist. The only story I have ever done on environment is one video story I did for my Video Journalism class – on the issue of Victoria Harbour in Hong Kong. My experience with the inter-discipline of media and environment started Dec.2009, when I interned forClean Air Network in Hong Kong on its social media marketing. Soon I turned to WWF Hong Kong as a part-time, in its communications team, mainly writing press release and columns, and luckily helped organize the Earth Hour event. After that I headed off to Beijing in May 2010 for a summer internship at the Environment and Energy Team under United Nations Development Programme, where I ended up delivering new media workshops to the team. In Sep I started my job at the South China Morning Post in Hong Kong and my first project is directly related to environment issue as well.